These days, when authors are routinely called upon to be showmen as well as writers, Anne Tyler is something of an anomaly. She won’t do face-to-face interviews or read from her work in public or go on book-promotion tours. She prefers to let her books speak for themselves, and they certainly do. She has now written 19 novels, one of which, her 11th, “Breathing Lessons,” won a Pultizer Prize for fiction in 1988. Her titles also include “Dinner at the Homesick Restaurant,” “The Accidental Tourist” and “The Amateur Marriage.” Born in Minneapolis but reared in Raleigh, she now lives in Baltimore. Love and grief are inexhaustibly attractive subjects for novelists, and Tyler is no exception. In this one, she gives us Aaron, a vanity-press publisher of “Beginners” books – similar to the “Dummies” series, but by self-published writers. He is a youngish widower whose doctor wife has been killed in a freakish accident. Aaron has long had a crippled arm and leg, and following Dorothy’s death, he moves in with his overbearing sister. Perhaps that is why Dorothy suddenly reappears in his life, from time to time. Or at least, Aaron thinks she does. After all, he is new at this widower thing. He could use a beginner’s book on grieving. With Dorothy’s help from beyond, or perhaps his own strength from within, he begins to learn how to let go. Tyler does the funny-but-sad thing very well. She can inject gentle humor into the saddest of situations, which helps to illuminate the considerable ironies to be found in the human comedy. Aaron and Dorothy are both engaging characters, and through them, Tyler teaches us again in her sure-handed way that love does not have to be perfect to be wonderful and life’s tribulations can be handled one small step at a time. “Over five decades of exuberant shape-shifting across the fictional landscape, Anne Tyler has cut the steady swath of a literary stalwart, writing novel after novel whose most memorable characters inhabit a cosmos all their own . . . What makes each story distinctive is the particular way its characters rebel against hereditary confines, cope with fateful crises, or forge relationships with new acquaintances who rock their world . . . Once again, Tyler exhibits her genius for the incisive, savory portrayal of marriage,” says novelist Julia Glass in the New York Times Book Review. “An absolute charmer of a novel about grief, healing, and the transcendent power of love . . . With sparkling prose and undeniable charm, Tyler gets at the beating heart of what it means to lose someone, to say goodbye, and to realize how we are all, perhaps, always ultimate beginners in the complex business of life . . . A dazzling meditation on marriage, community, and redemption,” says the Boston Globe. You can say hello to “The Beginner’s Goodbye” at the Downtown Hartford Public Library or the Albany, Camp field or Mark Twain branches. He once was a “Mad Man” who wrote advertising copy for such clients as Kohler and Pantene, but his drinking led to a life on welfare. A recovering alcoholic for more than 20 years, author Robert Goolrick is perhaps best known for his 2009 best-seller, “A Reliable Wife,” soon to become a movie. He also made waves with the frank family memoir, “The End of the World As We Know It,” which alleged abuse by his father. Goolrick lives in a small town in Virginia, and not so coincidentally, a Virginia town is the setting for his latest novel. He will speak about his book tonight at 7 p.m. at R.J. Julia Booksellers, 768 Boston Post Road, Madison. Information: 203-245-3959. It’s 1948 in Brownsburg, a tiny rural town in Virginia, and here comes World War II vet Charlie Beale, toting two suitcases. One contains, among other personal possessions, a set of butcher’s knives. The other is full of cold cash, money whose provenance will remain a mystery throughout this story. Charlie, a Northerner and a stranger and therefore the object of suspicion, manages to get hired by the local butcher and comes to love the man’s little boy, Sam, as if he were his own son. He also falls in obsessive, dangerous love with the stunningly beautiful Sylvan, the teenage wife of the town’s richest and nastiest man, who more or less bought her from her hillbilly family. Knowing just this much gives you a good idea of where this story is heading, and it’s not necessarily anyplace wonderful. The tale, which Goolrick told a USA Today interviewer he first heard in Greece and adapted to an American setting, is told mainly by Sam as an old man. Goolrick uses the hill country dialect and idioms of the Blue Ridge Mountains to tell his tale, which gives it the air of a sad country ballad, full of the betrayals and heartbreak you often find in country-Western songs. He’s telling the story of a romance too hot not to lead to violence. Though Goolrick refuses to tie up all the loose ends he lays out, his story reels you in and keeps you hooked. “…Just after WWII, 39-year-old veteran Charlie Beale arrives in small-town Brownsburg, Va., hoping for a brighter future. He offers his services to the local butcher, Will Haislett, and works his way into the good graces of Haislett’s family, especially five-year-old Sam. But even as Charlie finds acceptance, he remains apart in Brownsburg: he attends services in every church before finally finding redemption in an African-American Episcopal service; he buys up more land than he needs; and he makes a big mistake by falling for Sylvan Glass, the young wife of wealthy, old, vulgar Harrison Glass, who bought Sylvan at 17 “like a head of cattle.” Sylvan, an outsider like Charlie, dreams of Hollywood, while Charlie simply yearns for a place to call home. Goolrick (A Reliable Wife) tells their story from multiple perspectives, most poignantly that of Sam’s, a boy trying to make sense of the unfolding tragedy. Like any good ballad, the narrative builds slowly to its violent climax, packs an emotional punch, and then haunts readers with its quintessentially American refrain,” says Publishers Weekly. “Drifter Charlie Beale—toting a cash-stuffed suitcase and a set of premium butcher knives—moves to a small and notably crime-free Southern town. While the bloody writing is on the wall from the beginning, this novel is not a straightforward Southern gothic thriller but primarily a lyrical meditation on the magnified elements of small-town life: friendship, trust, land, lust, and sin. Sylvan, a beautiful hillbilly girl— literally purchased by the town’s richest man — has transformed herself into a shimmering imitation of a Hollywood movie star. Her seemingly preordained adultery with Charlie is both condemned and envied by the town. The soul of the story, however, is Charlie’s five-year-old companion, Sam, whose parents inexplicably allow him to accompany Charlie everywhere. As a witness sworn to secrecy, Sam is left tragically complicit in the adultery and its consequences. …Goolrick (A Reliable Wife) creates a timeless town where memory of an affair and crime can haunt forever. A lyrical yet suspenseful novel for general fiction readers,” says Library Journal. If you’re heading out to the Downtown Hartford Public Library or to the Goodwin branch on Thursday, June 28, or thereafter, you can borrow a copy. Being the son of conservative icon William F. Buckley gave Christopher Buckley a unique insider’s perspective on Washington, and this very funny writer has not hesitated to gore the many sacred cows of the right, the left and the in-between. His sardonic satire has earned him the Washington Irving Prize for Literary Excellence and the Thurber Prize for American Humor. Buckley, who lives in Connecticut, is a Yale graduate who by age 24 became managing editor of “Esquire” magazine. By 29, he was chief speechwriter to the then-Vice President, George H.W. Bush. He also was the founding editor of “Forbes FYI” magazine (now called “ForbesLife”), where he is now editor-at-large. He also has written for many major publications, such as “The New York Times,” “Washington Post,” “Wall Street Journal,” “The New Yorker,” “Time,” “Newsweek,” “Vanity Fair,” “National Geographic,” “New York Magazine,” “The Washington Monthly,” “Forbes,” “Esquire,” “Vogue,” and the “Daily Beast. Buckley’s 15 books include “Steaming To Bamboola,” “The White House Mess.” “God Is My Broker,” “Little Green Men,” “No Way To Treat a First Lady,” “Florence of Arabia,” “Boomsday,” “Supreme Courtship,” “Losing Mum And Pup: A Memoir,” and “Thank You For Smoking,” which became a 2005 film. Buckley is fascinated by political machinations and the people who do the machinating (OK, I just made up that word.) He also is fond of that normally despised creature, the lobbyist, and as in “Thank You For Smoking,” his new book’s anti-hero makes his living that way, but this time for an aerospace giant, not the tobacco industry. To help the company get funding for a secret weapon, “Bird” McIntyre gets the unpleasant job of stirring up American resentment of the Chinese government, as if he didn’t have enough agita in his personal life: an equestrian wife, an Alzheimer’s-stricken mom and a Civil War re-enactor brother, all of whom live at his country estate, which he has named “Upkeep.” (He’s also got a D.C. condo he dubbed the “Military Industrial Duplex.”) As the story gallops along, Bird gets involved with an Ann Coulter-like neocon named Angel and a complicated plan to trigger U.S.-Chinese trauma by threatening the life of the Dalai Lama. Sounds wacky? Sure, but Buckley makes it eerily and disturbingly plausible, and also hilarious. Your political leanings aside, chances are this book, like all of Buckley’s novels, will have you laughing out loud. He happily points out the foibles and follies of both sides of the political divide, and as with all good satire, his comedy teaches you plenty about the serious subjects he is skewering. “The title refers to the supposed culinary propensities of the Chinese, but as this novel makes clear, it’s said with more than a twist of irony….A lively and politically spirited read,” says Kirkus Reviews. “Writing comic fiction about world events demands wit and inside knowledge about Washington. It also requires an ability to see the light side of serious issues like China’s treatment of Tibet, the death of beloved spiritual leaders and America’s financial dependency on China. These are not funny topics, but Christopher Buckley’s new novel about them, “They Eat Puppies, Don’t They?,” is hilarious,” says USA Today. “With rising concern about China’s military buildup and its economic rivalry with the U.S., perhaps the best course of action is to milk the situation for some laughs. And there are laughs aplenty in Christopher Buckley’s sendup…. Creators of great works of satire, such as Jonathan Swift and Mark Twain, don’t appear often, but Buckley follows in the footsteps of fellow satirist Tom Wolfe in giving readers a delightful perspective on some of the leading issues and social mores of our times,” says the Associated Press. “Buckley is at his searing best…. Buckley knows Washington. He knows satire. He knows Dr. Strangelove and how to ratchet up absurdities. As our antiheroes get closer and the stakes climb, the book mixes outrageousness and plausibility like a dirty martini….. this is a funny book, and there’s nothing here to displease the devoted Buckley fan. And perhaps it speaks to his skill with satire that as the world teeters toward war, we find ourselves missing his lobbyist,” says The Washington Post. They’ve got it, don’t they, in the New Books section of the Downtown Hartford Public Library. Alice Randall’s first novel blew up a storm of controversy. “The Wind Done Gone” was a bold re-imagining of Margaret Mitchell’s classic “Gone With the Wind,’ told from the point of view of Cynara, the half-black half-sister of Scarlett O’Hara. While critics and many readers hailed its originality, many others, devoted fans of GWTW, hated the book for its perspective, use of slave dialect and its very existence. Mitchell’s estate sued Randall and her publisher, Houghton Mifflin, delaying publication of the book. The suit eventually was settled and “The Wind Done Gone” became a best-seller. Randall, a Harvard graduate, was born in Detroit, grew up in Washington, D.C. and now lives in Nashville, where she is writer-in-residence at Vanderbilt University Her other books are “Pushkin and the Queen of Spades” and “Rebel Yell.” She is also a successful country music songwriter. Her collaboration with singer Trisha Yearwood, “XXXs and OOOs (An American Girl)” was a 1994 No. 1 country hit, a first for a black songwriter. “…I am deeply intrigued by the problems and possibilities that began to arise when southern rural blacks migrated to the industrial North, including the particular difficulties encountered by black Americans when they seek to return home. “Ada’s Rules” is a novel, not a self-help or diet book, but it can be read for advice and inspiration as well as for its lively story. While you follow Ada’s journey, which is rewarding and fun to read about, you can use her rules to shed unwanted poundage and burdens of your own. “It is impossible not to fall in love with the plucky plus-size heroine of bestselling author Randall’s fourth outing… A heartwarming and engaging read, Ada’s story is more than that—readers following Randall’s rules will drop the pounds along with Ada, and perhaps discover something about themselves,” – says Publishers Weekly in a starred review. “[Randall’s] keen observations of black culture and the human condition impart a true celebration of aging, health, and beauty in the context of one woman’s life,” says Booklist. “…Randall’s honesty on life and change is refreshing, especially as she introduces characters who test and embolden Ada. A seemingly minor character offers the greatest moment of this novel; his story, woven almost imperceptibly into the narrative, shows the strength of Randall’s storytelling. Randall takes an ordinary weight-loss story and creates timeless personalities, demonstrating the challenges that we all face when reaching for a goal,” says Library Journal. “…The novel, with its chapter headings straight out of weight loss books—it’s almost something of a novel/diet book hybrid—is also suspenseful. What’s going to happen when Ada reaches her ideal weight? Will she reach her ideal weight? We know she’s not going to have an affair with Matt Mason. Or will she? It’s a delight to read about someone so fully human. In Ada Howard, Randall has pulled off the tough trick of creating a truly relatable, deliciously complicated character,” says Arlene McKanic in BookPage. You can follow “Ada’s Rules” with a copy from the Downtown Hartford Public Library or the Albany or Mark Twain branches. You may never have read anything by Buzz Bissinger, but it’s quite likely you’ve seen the TV version of one of his outstanding works of reportage: “Friday Night Lights,” which also was adapted as a 2004 movie. Bissinger is a best-selling, Pulitzer Prize-winning reporter (as part of a Philadelphia Inquirer team exposing city court corruption) and has written several notable books. “Friday Night Lights,” about the outsize role high-school football plays in a racially and economically divided Texas town, brilliantly shows how an obsession with sports can be a dangerous thing. “3 Nights in August” chronicled a baseball series between the Chicago Cubs and the St. Louis Cardinals, whose manager, Tony La Russa, Bissinger had befriended. In addition to his books, Bissinger is known for his sharp and detailed magazine reporting. He is a contributing editor at Vanity Fair and a sports columnist for The Daily Beast and has written for The New York Times, The New Republic and Time. Bissinger is at his best when he can immerse himself in the life of his subject, and in “Father’s Day,” he didn’t have to go far to do so. This is no sentimental father-and-son memoir: it is the heartbreakingly honest account of how the author came to finally understand, appreciate and celebrate his 24-year-old son Zach, a prematurely born twin who suffered brain damage while his brother Gerry went on to develop normally. Zach functions in the world, at best, like a 9-year-old. He can read but not always understand the words; can work, but only as a supermarket bagger. Yet he makes the best of his limited world, and he is an admirable man. The book tells how Bissinger, who admits to often emotionally distancing himself from Zach, takes his son on a cross-country trip that lets the young man explore life outside his strict and comforting routine, while the father, in turn, explores his son’s world. In the end, it is Bissinger who learns the most, and he shares this painfully gained knowledge with his readers. Bissinger writes eloquently without ever being fussy in style. The book does two things very well: it invites us into the life of someone we might otherwise turn away from and thereby miss knowing a fascinating person; and it also gives us a frank appraisal of how having a damaged child can affect a father in difficult-to-admit ways. “I am meeting Zach at Brooks Brothers in the sodden, sullen aftermath of Christmas. He has just come from work at the supermarket where he has bagged groceries for four hours with one fifteen-minute break. I cannot imagine my son doing such work at the age of twenty-four. It shames me to think of him placing sweat-drenched jugs of milk into their proper place and learning initially, with the extensive help of a job coach, that the eggs must be placed separately in double plastic bags. He has been doing the same job for four years, and he will do the same job for the rest of his life. My son’s professional destiny is paper or plastic. “…. His IQ, which has been measured far too many times, is about 70, with verbal scores in the normal range of 90, but with performance skills of about 50. I love my son deeply, but I do not feel I know him nor do I think I ever will. His mind is not simple. It is limited to a degree that profoundly frustrates me, but it is also inexplicably wondrous at certain moments. I have dedicated my life trying to fathom its inner workings. “…. As much as I try to engage Zach, figure out how to make the flower germinate because there is a seed, I also run. I run out of guilt. I run because he was robbed and I feel I was robbed. I run because of my shame. I am not proud to feel or say this. But I think these things, not all the time, but too many times, which only increases the cycle of my shame. This is my child. How can I look at him this way? “It’s a barely guided tour through Mr. Bissinger’s own roiling anxiety, his depression, his narcissism and his profound insecurity, not to mention what he sees as his failings as a man, as a father, as a son and as a writer…”Father’s Day” is riveting and a bit frightening…it’s a brutal and vivid [book], the work of a writer with an unflinching gift for honesty, and impossible to put down. I read it in two short gulps, occasionally through the cracks in my fingers.” says Dwight Garner in The New York Times. “Bissinger has the great writer’s gift of showing us we are not alone. Here he explores the religion all parents share: that our children’s essential goodness will somehow grant them safe passage through a rough world. What a book! Every parent should read it,” says TV host and author Chris Matthews. 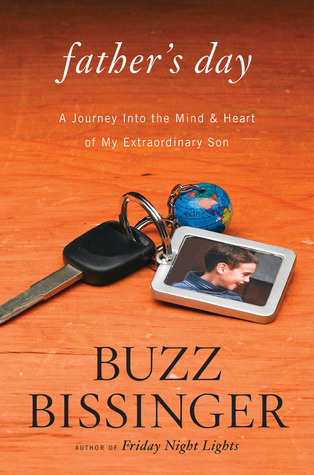 “Buzz Bissinger has given completely of himself in this moving book about his son Zach, who was born too small, too soon. There is the father’s disappointment and guilt, his confusion and frustration, his wonder and love. That Zach has a twin brother, who grew up unscathed, and that Zach’s mind is as divided as his father’s emotions, makes the story all that more compelling. “Father’s Day” is wonderfully, achingly written, with all the doubt that tells you how truthful it is,” says author Frank Deford. You can borrow it now from the Downtown Hartford Public Library or the Blue Hills branch. Other inspiration for the book came from her extensive travels, which began when she chose to attend Callison College, a school of International Studies at the University of the Pacific, because it offered a sophomore year in India. Set in the late 16th century, it is the story of a rare creature for those times: a female physician. Having been taught the healing arts by her father, a respected doctor in Venice, Gabriella Mondini is in danger of losing her acceptance by the skeptical male world of medicine after her father disappears on a trip he is making to research his masterwork, “The Book of Diseases.” So, following clever clues he has left for her, Gabriella sets out in search of her missing mentor, allowing the author to take us on a journey through Europe to Morocco. Gabriella is accompanied by two servants, who provide a bit of comic relief as she encounters a great deal of medieval misogyny in her quest. This is a fanciful and whimsically told novel, full of fascinating detail about medicine in a time long, long ago. It can be read as a mystery, an adventure or a picaresque novel about early science, the history of medicine and women’s fight for respect. And yes, a love story is woven in. Fans of historical novels will appreciate this travelogue back to a more primitive, yet richly rendered, time. “Gabriella Mondini is a woman ahead of her time. She’s the lone female practicing medicine (with her father’s sponsorship) in 16th-century Venice. Then her father vanishes, and she spends years traveling from Italy to Scotland to Morocco and more to find him, teased along by the occasional letter he’s sent. In her fiction debut, poet O’Melveny draws on her Italian artist mother’s memoirs of Venice and her own father’s disappearance when she was young to create a story of real longing, says Library Journal. “Poet O’Melveny’s debut fiction is like a lyrical composite creature — part father/daughter epistolary novel, part aristocratic diary, part adventurer’s travelogue, and part compendium of allegorical diseases…Readers will be delighted by O’Melveny’s whimsical embellishments,” says Publisher’s Weekly. This book is at the Downtown Hartford Public Library and the Camp Field branch. Jack Hitt, pardon the pun, is no one-hit wonder. His work can be found on the page – including The New York Times Magazine, Harper’s, Rolling Stone, GQ, Wired and Garden & Gun – and on public radio’s “This American Life” and on the stage, in the solo theater performance that is currently touring, entitled “Making Up the Truth.” He has won the Peabody Award, as well as the Livingston and Pope Foundation Awards. From Benjamin Franklin’s electricity experiments with a kite to Mark Zuckerberg’s dorm-room musings that led to Facebook, America has a long and proud history of amateur tinkerers who went on to invent or perfect great ideas, processes and products. Hitt explores a fascinating collection of these outside-the-box explorers who, he says, are living embodiments of the power of the American dream. He looks back at past inventors but focuses on current researchers and dreamers looking to create something new and amazing. The good news, he says, is that American inventiveness seems to blossom in cycles and we are beginning a new one now. Written with great good humor, this book is loaded with fascinating anecdotes about obsessive but brilliant people who are doing their best to change the world in positive ways. There ideas and methods are intriguing, and while some may at first seem downright nutty, such as glow-in-the-dark yogurt, Hitt convinces the reader that their efforts are important and often thrilling. The electronics revolution is remaking our lives right now, and Hitt makes the case that there is more to come from the brilliant if quirky amateurs he writes about. Hitt’s book is thought-provoking and fun to read. “A love letter to American culture…as fascinating as it is inspiring, this hilarious book is a tour de force that celebrates troublemakers, risk takers, and the American spirit,” says Publishers Weekly. “Jack Hitt is a latter-day Twain: a Southern storyteller and Yankee skeptic who slaughters sacred cows with unfailing wit and a childlike sense of wonder at the world. This makes him the perfect guide to the wacky yet inspiring universe of American inventiveness. Hitt’s playfully profound book had me laughing with pride at the amateur in us all,” says author Tony Horwitz. “…a fabulous tribute to amateurs….This is a totally absorbing gallery of oddballs and obsessives on the brink of possibly great discoveries, written by a man with a deep appreciation for amateurs and their pursuits,” says Booklist. “A guide through the sometimes-consequential, sometimes-zany realm of amateurs. Veteran journalist Hitt …posits that various brands of amateurism conceived in the interest of advancing knowledge offer meaningful insights into a uniquely American character. The narrative thread holds together nicely through chapters focusing on the legendary amateurism of Benjamin Franklin, birdwatchers seeking the ivory-billed woodpecker, inventors of various gadgets, genealogists, archaeologists, astronomers and linguists. Hitt wisely concedes that other nations harbor amateurs, as well, but he maintains that American amateurs are notable for their comfort with exploration and with rebelling against authority. …Searching for lasting answers, Hitt studies business theory, providing a serious explanation that outsiders are often not hidebound by the curse of knowledge. In other words, when it comes to reconceiving a workplace, an industry, a charitable endeavor or some other institution, perhaps ignorance sometimes can be considered bliss,” says Kirkus Reviews. Amateurs and pros alike can find this book on the new books shelf at the Downtown Hartford Public Library. “Home” is relatively short on pages but is long on power. Set in the 1950s, it is the story of Frank Money, a black soldier recently returned from the Korean War, who finds his younger sister, Cee, is in a world of trouble, working for an unscrupulous doctor who is performing dangerous experiments on her. Frank is suffering post-battle trauma and fully aware of the racism that still runs rampant in mid-20th century America, but his need to rescue Cee and bring her back home to the little Southern town they once hated gives him a purpose and a plan that helps him find himself. Morrison is an amazingly good writer, whether her prose style is lyrically lush, as it was in “Paradise,’ or powerfully spare, as it is in “Home.” Reviewers are saying that this short novel can be consumed in one sitting, as an exquisite dinner might be. Once Morrison ensnares you with her gorgeous authorial voice and compelling stories of love and betrayal, she does not let you go. “A deceptively rich and cumulatively powerful novel…. even more crucially, it’s about the relationship between the brother and his younger sister, which changes significantly after his return home, as both of them undergo significant transformations. … A novel that illuminates truths that its characters may not be capable of articulating, says Kirkus Reviews. “Toni Morrison doesn’t have to prove anything any more, and there’s artistic freedom in that calm. Her new novel, “Home,” is a surprisingly unpretentious story… this little book about a Korean War vet doesn’t boast the Gothic swell of her masterpiece, “Beloved” (1987), or the luxurious surrealism of her most recent novel, “A Mercy” (2008). But the diminutive size and straightforward style of “Home” are deceptive. This scarily quiet tale packs all the thundering themes Morrison has explored before. She’s never been more concise, though, and that restraint demonstrates the full range of her power,” says Ron Charles in The Washington Post. “The events of this narrative are striking and arresting in the manner that one expects from Morrison, the only living American Nobel laureate in literature. Family secrets are revealed, brutal truths about the history of race in America are displayed without sentimentality or animus. As always, Morrison’s prose is immaculate, jaw-dropping in its beauty and audacity. . . . In addition to her reputation for gorgeous sentences, Morrison is known for a certain brutality in her plotting, and this wrenching novel is no exception. But “Home” also brims with affection and optimism. The gains here are hard won, but honestly earned, and sweet as love,” says Tayari Jones in the San Francisco Chronicle. “Home” is on the new books shelves at the Downtown Hartford Public Library and the Barbour, Blue Hills, Camp Field, Dwight, Park and Ropkins branches.